Editor’s Note: If you fish visible cover with a pole, sooner or later, you will become a jig pole fisherman. 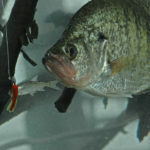 What do you do if you are fishing for crappie with minnows, and you run out of minnows? 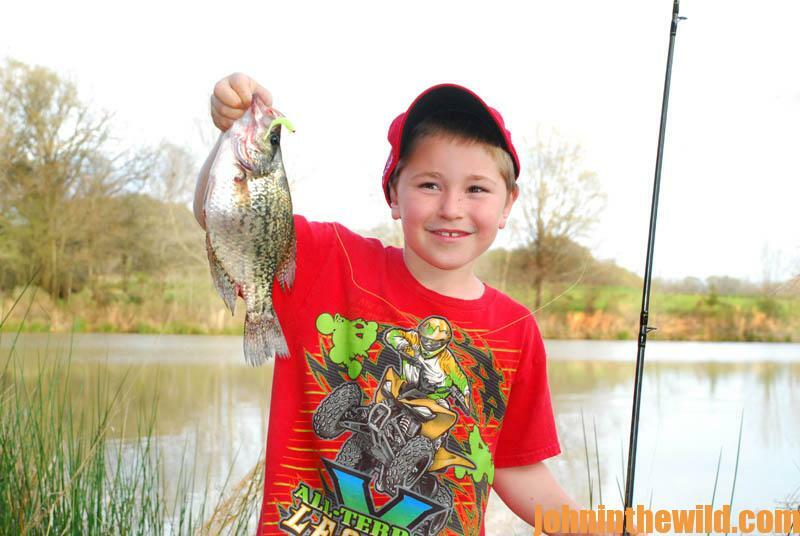 Do you go home with the fish that you’ve caught and leave the crappie biting? Or, do you continue to fish with nothing but a jig on the end of your line? 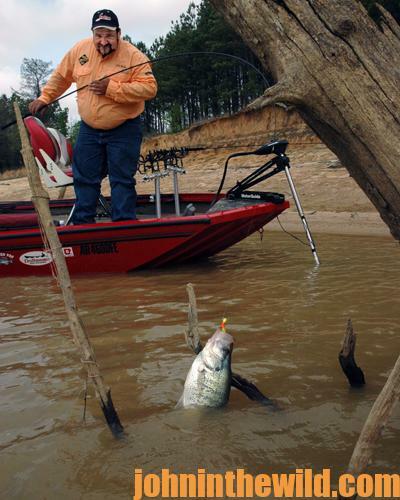 For many crappie anglers, once they’ve tried jig pole fishing, they’ve become addicted. 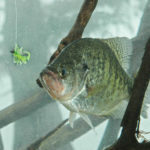 Even when they’re using minnows, when they find the crappie schooled-up, they will switch to jig pole fishing. Jig pole fishing: allows you to fish your jig vertically through various water depths in even the thickest cover; lets you work the cover more thoroughly than when using a cast-and-retrieve method of fishing; and spooks fewer crappie because you pull the crappie straight up out of the cover instead of dragging that slab through the cover. “I believe that because of the sensitivity of the jig pole, I can feel a strike better than I can on a rod,” Gary Brazeale of Star, Arkansas, a longtime jig poler comments. “I also know I’m not nearly as limited when I’m fishing with a pole as I am when fishing with a rod. With a rod, you only can cast your jig into certain places without getting hung. 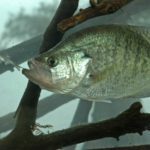 However, with a jig pole, I can put my bait through a 1-inch hole in any bush or treetop I see where I believe crappie are holding. 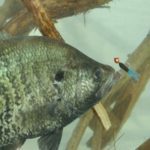 The jig pole allows the crappie angler to fish every possible part of the visible cover he’s fishing around. Brazeale has learned to utilize his jig pole tactics to fish every part of the cover when he’s fishing stumps and trees under the surface, just like he does when he’s fishing stumps and trees he can see. By learning to feel what the jig is touching under the surface, an experienced jig pole fisherman can work segments of underwater cover that an angler who casts and retrieves, trolls or even minnow fishes can’t. During the colder months, Brazeale has found larger jigs usually produce bigger crappie. “Cold-water fish bite slowly,” Brazeale reports. 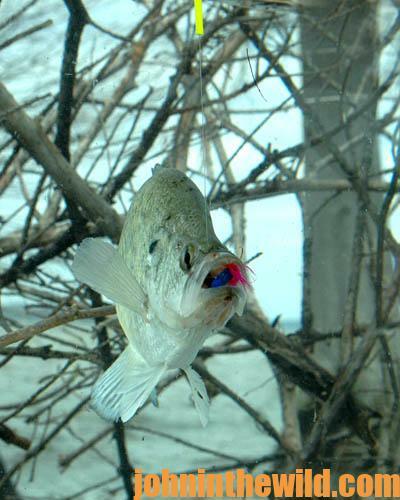 “If you put a big jig in front of a small crappie, the fish usually won’t take the bait. 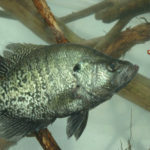 But if a large crappie spots a bait it can catch and eat easily and quickly without expending much energy, the fish will take the bigger jig in that thick cover. 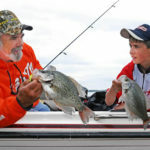 “When I once fished tournaments in the wintertime, in years past, I’d use the small jigs to catch a limit of crappie and the big jigs to take the larger fish. Then I culled the smaller ones. 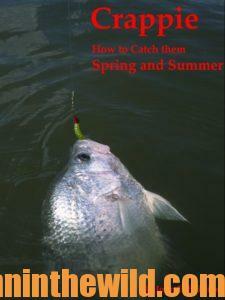 For more tips and information on catching crappie, check out John E. Phillips’ Kindle and print books “Crappie: How to Catch Them Fall and Winter” and “Crappie: How to Catch Them Spring and Summer,” also available from Audible at https://www.audible.com/pd/B06XTV9J2F/?source_code=AUDFPWS0223189MWT-BK-ACX0-083098&ref=acx_bty_BK_ACX0_083098_rh_us. Or, go to http://www.amazon.com/John-E.-Phillips/e/B001HP7K6O to see all of John’s books. 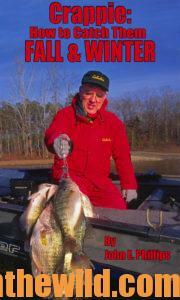 To receive and download for free “The Crappie Catchers’ Cookbook,” by John and Denise Phillips, go to https://www.dropbox.com/sh/1tvp5nmxp8jycjf/AAAiOTM6vHolzGV44kO2oEnKa?dl=0.